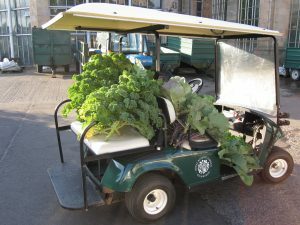 The Botanics buggy laden with produce from the Really Wild Veg trial awaiting weighing and assessment of pest and disease infestation. On a glorious sunny morning with the first hints of autumn colour in the trees it seemed like as good a time as any to harvest the Really Wild Veg trial plots that have been growing in the Demonstration Garden. The project has been growing domesticated crops alongside their Scottish native wild ancestor to allow assessment of a range of characteristics that may have changed during the process of domestication. The nutritional quality is being assessed by the Rowett Institute of Nutrition and Health and initial results show that wild ancestors of radish have significantly higher levels of chemical compounds linked to the prevention of cancers and cardiovascular disease. Results on the other crop trials – cabbage, beet and carrot – will hopefully be available soon. It is not a total surprise that health-promoting chemical compounds that we are still learning about have declined through the process of domestication. You cannot select for characteristics that you don’t know about. So what have people been selecting for? The observations made at the time of harvest in this citizen science project provide some insight into this question. The numbers of plants in each trial are too small for this data to be statistically robust, but some clear trends have emerged that reveal differences between wild type, heritage and modern F1 hybrid plants. In the brassica trial wild cabbage from coastal cliffs in Fife was grown alongside a heritage kale called ‘Red Russian’ and a modern F1 hybrid kale called ‘Reflex.’ The results from the Botanics trials do demonstrate some marked differences between these three brassicas. These results suggest that the modern F1 variety is the most productive by some margin. It produced almost four times the weight of the heritage kale. As productivity is a desireable characteristic it is easy to see why it would be selected for. F1 hybrids should in theory be particularly productive as they take advantage of a phenomenon called ‘hybrid vigour’ in which the cross between two distinct varieties of plants will produce hybrid plants that are both consistent in their characteristics and more vigorous than either of the parent varieties. In both wild cabbage and F1 kale the level of aphid infestation was low. The particularly low level in the wild plant suggests it has strong defence mechanisms that have resulted from natural selection. In contrast, the heritage kale suffered most with aphid attack and lost many of the lower leaves to a combination of aphids and mildew (see below). The incidence of mildew differed even more dramatically than aphid infestation. Both wild cabbage and the F1 hybrid were entirely free of this disease, whilst the heritage kale suffered heavy infestation on all but the youngest leaves. The overall impression is that wild cabbage is very good at fending off pests and disease and is reasonably productive at 70% of the weight recorded for the F1 kale. For a grower productivity is key and on these data it would seem that the F1 is the best choice. The heritage variety seems least attractive with a productivity only managing 26% of that seen in the F1. If we consider the results of two blind taste tests we get a very different assessment of these plants. Using this criterion the heritage kale is most desirable and in the larger taste test of 104 people was a clear winner with just over 60% of the vote. What all of this shows is that there do appear to be quite marked differences between the brassicas in the Really Wild Veg trials. The desirable trait of good flavour does not appear to be linked to high productivity in this instance. The highly productive F1 plants did poorly in taste testing and were described by some people as being ‘bland.’ The fact that desirable characteristics like taste are not combined with others like productivity and disease resistance shows that there is scope for plant breeders to create new and improved crop varieties. If the initial results showing high levels of health-promoting compounds in wild radish proves to be true for wild cabbage this will strengthen the argument that wild cabbage has a role in the breeding of varieties that help to fend off disease in humans.